Description: The composition is made of woody, spicy and aromatic aromas. It is signed by perfumers Olivier Pescheux and Jacques Huclier. The fresh start combines pungent grapefruit and sweet mand.. DESCRIPTION : is a Woody Aromatic fragrance for men. King of Seduction was launched in 2014. Top notes are grapefruit, bergamot, pineapple, melon and green apple; middle notes are neroli, ja.. Description: Aqva Amara, meaning 'bitter water,' is a new masculine fragrance from Bvlgari. Inspired by Bulgari' Greco-Roman heritage, the fragrance preserves the distinctive aquatic and Mediterra.. Description: Pour Homme Soir is a rich, elegant and woody scent aimed at charismatic men looking for a refined and sensuous evening fragrance. .. Description: CK One Summer by Calvin Klein is a Citrus Aromatic fragrance for women and men. CK One Summer was launched in 2004. 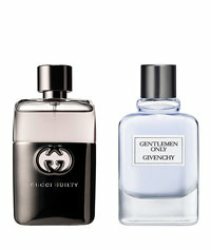 Top notes are kiwi and citruses; middle notes are cactus, blueberry..
CK SHOCK HER GS (EDT 200ML+BW100ML).. Description: The top notes are aromas of grapefruit, bergamot, elemi resin and Sicilian lemon. The heart includes Atlas cedar and vetiver with ginger, while base notes include sandalwood accords .. Launched in 2014 with the Dolce fragrance, the eponymous collection from Dolce&Gabbana expanded in 2015 with Dolce Floral Drops, and is welcoming the new flanker Dolce Rosa Excelsa in early 2.. Description: Absolutely Me opens with fresh fruit accords and raspberries. The heart is filed with delicate aroma of pink Rose Macaron, followed by soft vanilla in the base. ..
J.DEL POZO AMBAR EDT 100ML VAPO..
Lacoste Live is enriched with freshness of lime in top notes, announcing a blend of green leaves and sea notes in the heart, relating on a base created of liquorice and guaiac wood.&nbs..
PACO RAB ONE MILLION INTENSE EDT 100ML.. DESCRIPTION : The perfume opens with tart-citrusy ginger blended with aromatic flavors of juniper berries. The heart of the fragrance is enriched with lavender, while the base is warmed with vanil..
VERSACE VERSENSE EDT 100ML SPRAY..